Stephen Perse Junior School pupils enjoyed a week of integrated learning centred around the theme of 'It's Our World'. 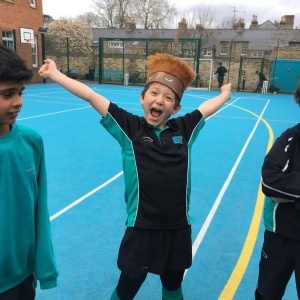 The week commencing Monday 11 March saw the Stephen Perse Junior School undertake an integrated learning project across all the year groups. The theme of the week was 'It's Our World', really focusing on the environment and on climate change. Each of the years took on different activities as well as some whole school projects. Here each year group tells us about their week. Throughout the ‘It’s Our World’ project Year 3 pupils have very much been thinking about water conservation. We completed a number of practical tasks in order to explore this topic in detail. Our first task had a simple take home message... the cleaner we can keep our water, and the less we use, the easier it is on our treatment process. As a group, pupils had to come up with a filtering system to turn 200ml of dirty water into the clearest sample possible. This was scientific enquiry at its best. The second challenge saw us looking at flooding around the world. Working as a team and set on the fictitious island of ‘Watu’, pupils were challenged to design a home for a community on Watu Island able to withstand the effects of flooding, then make a model of their design and test it. Nerves were frayed as the clock counted down until the predicted downpour. Housing had to withstand rising water levels over a period of time. This certainly gave us all an appreciation for what it must be like for vulnerable communities anticipating extreme weather conditions. Our final practical session got us thinking about Bangladesh and the effects that climate change is having there. Climate change has a major impact on those communities living in riverside areas. Heavier, longer rainy seasons mean that land where farmers used to be able to grow crops to feed their family is being flooded before crops can be harvested. As a result, families go hungry. 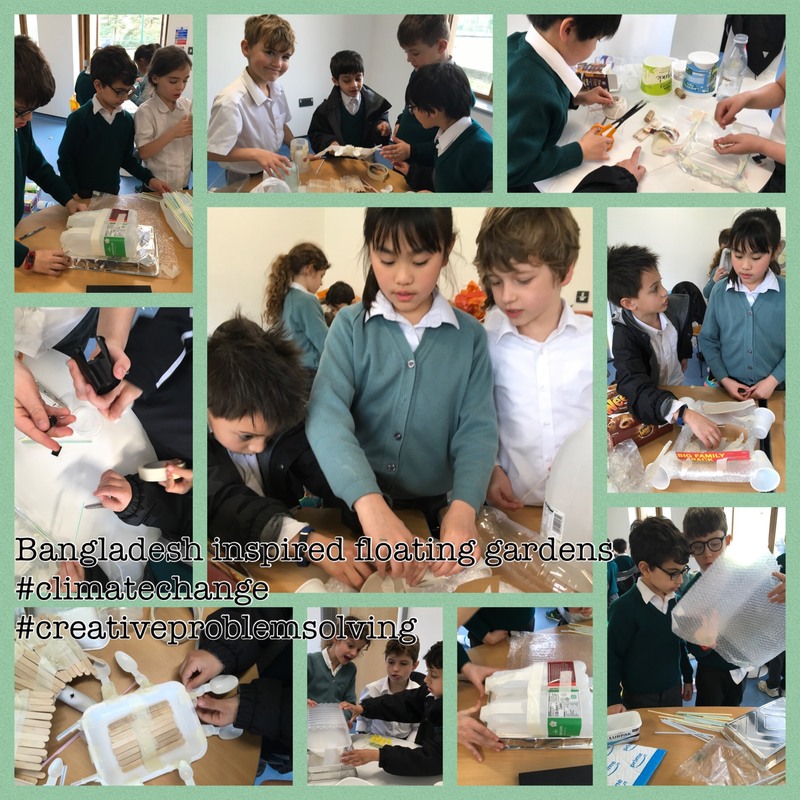 In this challenge, pupils were tasked with designing and making a structure that would enable farmers to continue to grow their crops, even when the land floods. 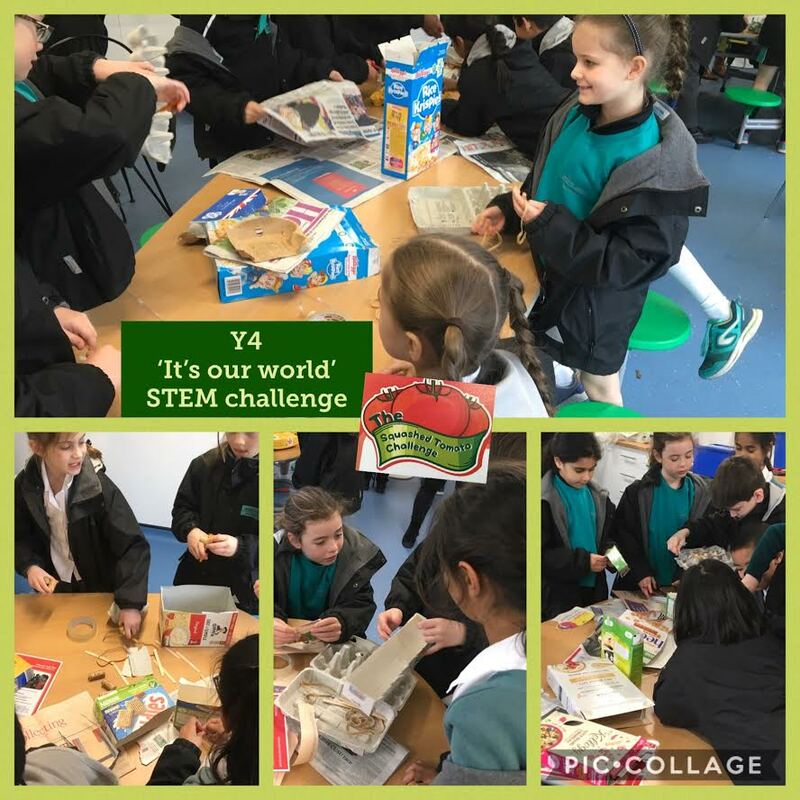 Modelling equipment such as plastic drinks bottles, small plastic and polystyrene food trays, straws, K’Nex, corks, and lolly pop sticks were all creativity assembled and put to the test down at the Eco Classroom. Successful designs floated and we are now patiently waiting to see if our crops grow. We were delighted to hear the buzz of young minds, coming up with creative solutions to the task. A highlight was seeing the children’s utter joy in receiving their own ‘chickens’ to add a small livestock element to their floating garden designs. No Junior School integrated project would be complete without a playground sale. Pupils delighted in creating their own games such as, The Great Ocean Clean Up and Sort the Rubbish into Recycling. Our Year 3 team feel that our blue planet is in safe hands, as we have observed and heard pupils tackling real world problems with exciting solutions, cooperative commitment and great empathy. Year 4 pupils explored the theme of ‘Food and Farming’ as part of our whole school theme ‘It’s Our World’. We journeyed to the eco-classroom to complete a STEM activity entitled ‘The Squashed Tomato Challenge’. This involved coming up with a solution to the real life problem that farmers in Nepal face when trying to transport their tomatoes down a steep mountain to sell at market. Pupils worked collaboratively and creatively in groups to design and make a container that would transport their tomatoes down a zip wire without squashing them. We are pleased to report that most tomatoes remained intact! 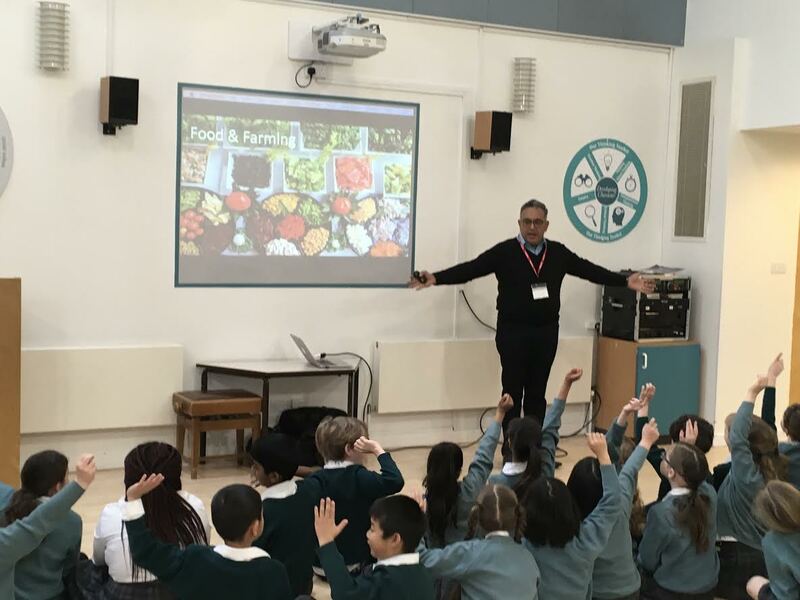 Later in the week we welcomed Mr Datta who talked to us about the future of food and farming. This excellent and engaging talk really made us all think carefully about how farming could become more sustainable and discuss what actions we might need to take so that there will be enough food for everyone in the future. This was followed up by a year group discussion on how to ensure we do not waste food. Look out for our completed posters on display around school! Year 5 have had a focus of climate change within the 'It's Our World' integrated learning project. We have been busy adding up the mileage we have accumulated from walking and cycling to school. Year 5 alone have managed to get halfway to Paris! We are proud of this achievement because we know that these small steps will have a big impact on improving the climate of our city. On Monday afternoon we spent an entertaining afternoon at the eco-classroom, learning about sustainable energy. Our first task was to try and recreate the National Grid with human pylons and lengths of string. It helped us to realise just how much electricity flows through London and we were able to see how smaller communities need a smaller supply. When we tried to create the same grid for towns and villages in an African country, we realised that some communities don't have any source of electricity at all, whilst others are well-connected. This shows us how the world's resources are not equally distributed. We know that electricity can be generated from wind turbines, so our next task was to make our own turbines. We worked in groups, each representing a different country and we were given resources: paper, card, straws and tape. But these were unfairly distributed. The UK, for example, had far more materials available to use than Kenya. A great deal of thinking, innovation and collaboration was needed as we designed the most efficient prototypes of our wind turbines and tested them for efficiency. The most successful used lightweight blades, with no more than four blades per turbine. A slight depression in the blade also enabled the turbine to turn faster and therefore produce more energy. We were interested in finding out about how much electricity we use in everyday life - ‘I never knew that the kettle uses more electricity than lights’ - and it has helped us to think carefully about unplugging devices in our homes. Dr Nina Seega returned on Friday morning to deliver a special workshop for Year 5 pupils. Knowing how receptive SPF Juniors are to higher level thinking, Dr Seega gave a presentation which was recently delivered to the C-suite of insurance companies. 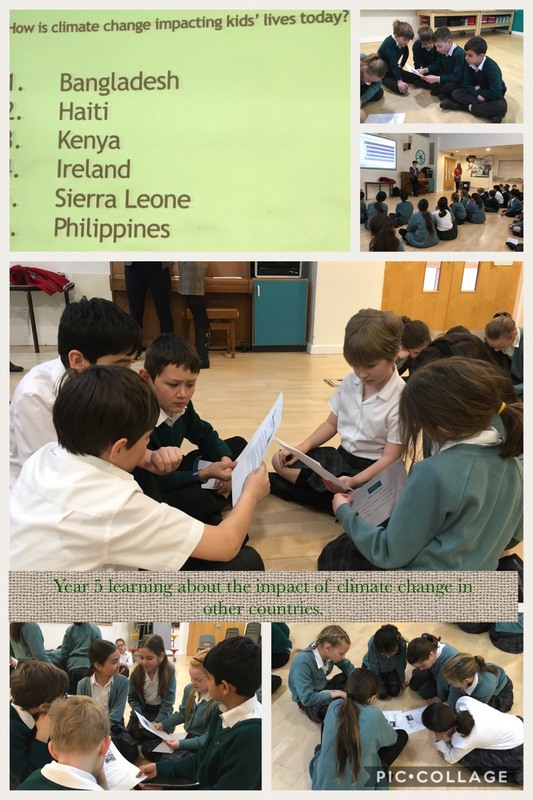 Our pupils were given the opportunity to read stories about other children in the world and how their lives have been affected by climate change. We then considered what changes we have noticed in and around our local community of Cambridge, which have been caused by climate change. Finally, pupils shared their own stories and ways in which they and their families are taking positive action to protect our world. Caterina told us that she and her family try to buy natural products. Tamara is encouraging her family to cycle to church rather than drive. Samuel shared with us that he tries to fix his broken toys rather than throwing them away. The week ended with an exciting playground sale in aid of Toilet Twinning. Many of the Year 5 stalls had a focus on sustainability: a lucky dip to find recyclable items, a maze to guide a lost polar bear to its ice cap, hook the non-compostable items from the compost bin and match the teacher to their own toilet! The first week of ‘It’s Our World’ has been a huge success and we are looking forward to exploring these ideas further. Our pupils have already begun to consider the impact that they have on this special planet and how they can help with small steps to make big changes. Year 6 pupils have thoroughly enjoyed participating in the varied and thought-provoking activities that have made up the Junior School’s Integrated Learning Project. From writing poems about sustainability and designing solar powered buggies, to hearing about the dangers of microplastics, focusing on their world has certainly got all of Year 6 thinking and talking. The excitement was palpable when they took part in the JS Kahoot! that focused on the United Nations 17 Sustainable Development Goals and, in PSHEE, Year 6 pupils were given the chance to choose one of these goals and to think about how they could help achieve it. 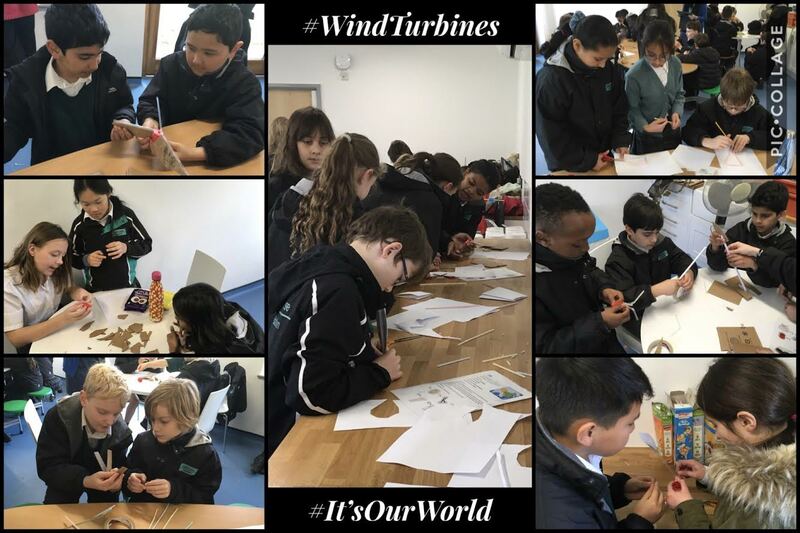 Year 6’s session at the eco-classroom focused on renewable energy, specifically wind turbines. The session started by looking at how, in the UK, every household is connected to the National Grid, whereas in countries such as Kenya the smaller villages are isolated. This prompted a discussion as to how villages like this might get power and the answer Year 6 came up with was: wind turbines. The main task consisted of pupils working in teams to build their own wind turbine blades out of everyday objects. It helped build teamwork and they needed their creative and critical thinking skills in the forefront of their minds as they set to the design task. 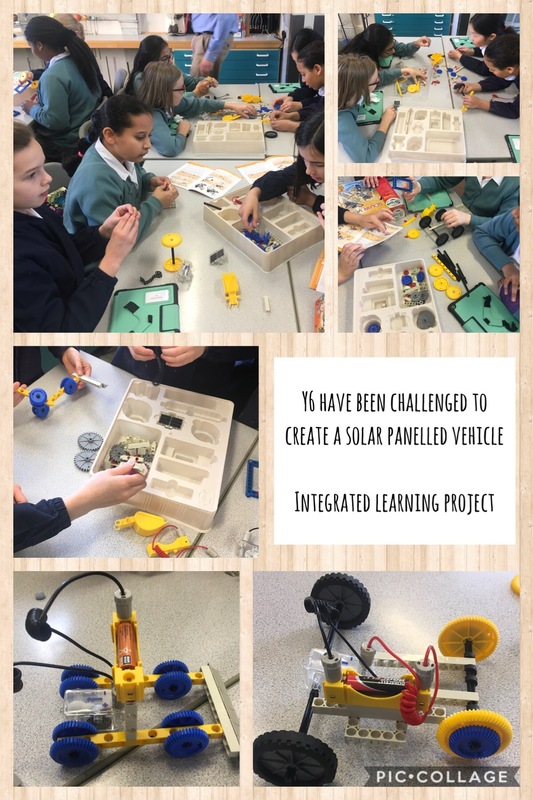 English and Science lessons were not left out this week with Year 6 writing poems about sustainability in English and building solar-powered buggies in Physics. 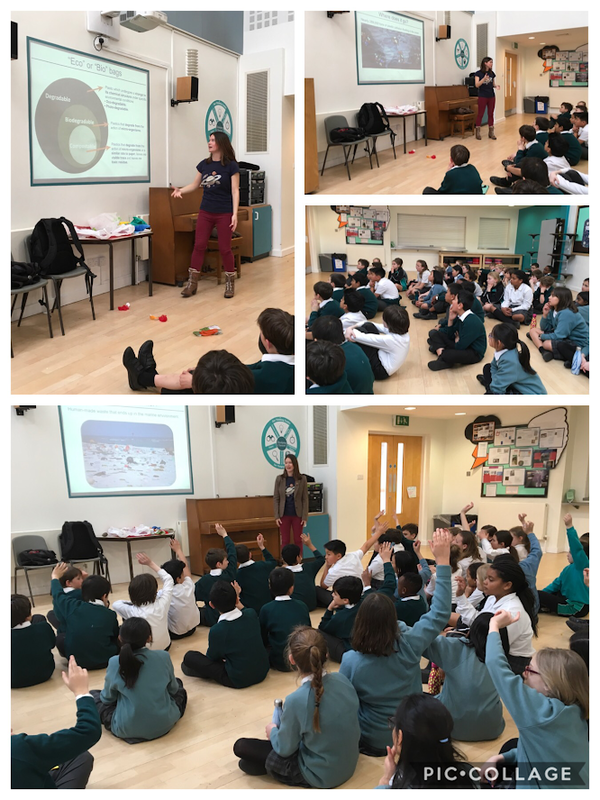 We are extremely grateful to Dr Dannielle Green, an ecologist from Anglia Ruskin University, who gave up her time on Thursday to ask Year 6: Where plastic pollution comes from? What are microplastics? What impact can plastic have on plants and animals? What they can do to help? Her talk was fascinating and so relevant and her message, that it is everybody’s responsibility to look after our world, came through loud and clear. Overall, Year 6 pupils have loved thinking about their world and are thoroughly looking forward to hearing from the panel of experts.